Volunteers work to make the beach clean again. FOR a quick getaway from hectic city life, people would usually go to the nearest spot for an outing such as the beach. The soft breeze with a tang of salt in the air and sauntering with sand between the toes provide a simple, sensory filled retreat from everyday life. Seashells and the occasional starfish and corals washing up with each wave are heavenly. However, such is not always the case during trips to the beach. More often than not, the reality is rubbish, rubbish, rubbish – everywhere. Clearing the garbage left at a bonfire pit. To Alcila Abby, beaches hold fond memories. She frequented the beach – her favourite spot – when she was young. Back then, it was clean but littering became rampant as time went by. She is shocked to see how bad the situation has become – garbage strewn everywhere, making it no longer safe to walk barefoot on the sand. To tackle this people-created pollution, she formed the Kuching Beach Cleaners. For her, a dirty environment is not only an eyesore but also reflective of the couldn’t-care-less attitude of society at large towards keeping the surroundings clean. “Take the beach for example. Most people think they don’t have to play their part in keeping a beach clean. But they forget in the long run they are the losers because they don’t have any more clean beaches to go to for a picnic or a relaxing day by the sea. The future generations will be similarly deprived,” Alcila noted. She said Kuching Beach Cleaners helps to promote conservation by encouraging both young and old to respect Mother Nature. 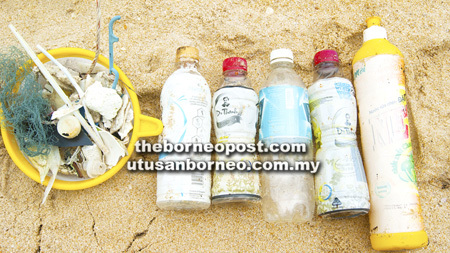 Plastic bottles from Thailand and Vietnam were among the rubbish collected during the beach clean-up. And one way to do this is to make them see the importance of keeping the environment pollution-free through education. “Most people have a tidak apa attitude because they think discarding one plastic bag won’t do much harm to the environment but if everyone thinks like that, then the number of discarded plastic bags will grow and grow. Alcila said pollution usually starts with throwing away rubbish indiscriminately – onto roads and into drains, adding that the wind will blow the rubbish across a wide area, polluting not only the land and also the rivers. Describing the cycle of pollution as what goes around comes around, she cited the example of rubbish ending up in the sea, getting eaten by fish, fishermen catching the fish, and people buying the fish and eating them. “So at the end of the day, what we have is contaminated food on the dining table,” she added. Besides affecting the seafood we consume, used plastic bags swept out to sea also endanger marine life such as turtles and whales, which often mistake these floating transparent materials for jellyfish or plankton, their natural food, and die of starvation due to indigestion after swallowing them. 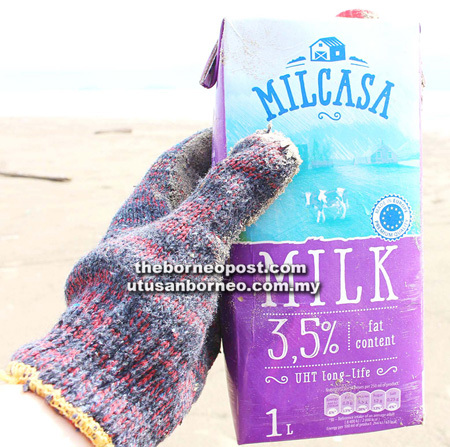 A milk carton washed up on Pandan Beach came all the way from Poland. “This can also affect the food chain and, hence, the health of marine life. Future generations would be deprived of the opportunity to see these wonderful deep sea creatures if they were driven to extinction by unchecked oceanic pollution,” she said. 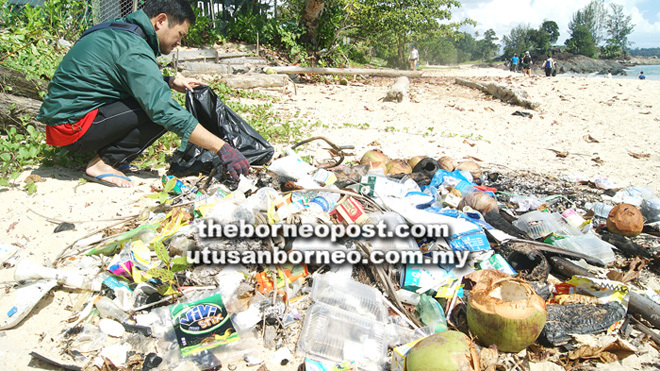 The latest beach clean-up was held on June 23 at Pandan Beach, Lundu, taking two hours. It was carried out together with Sarawak Eco-Warriors and Wildlife Conservation Society. The volunteers, armed with fabric gloves and sunblock, were divided into groups and assigned areas. The rubbish collected was placed at nearby garbage collection centres for disposal by the Lundu District Council. The total amount of litter collected was 278kg – 68 bags full – consisting of polystyrene containers, plastic bottles, straws, lighters, bottles, cigarette butts, food wrappers, and others. Alcila noted that the worst culprit was plastic which, according to studies, could take up to 1,000 years to decompose. While plastic bottles could take 450 years or more to biodegrade, polystyrene, on the other hand, could take between a few years and up to one million years, depending on the thickness. She, thus, lauded efforts by local councils to ban the use of plastic bags and polystyrene containers. Some eateries have already switched to paper boxes. She hopes the public would seriously consider following suit by becoming more friendly to the environment. “They should make it a habit to bring their own containers and water bottles when buying takeaway food and drinks, and reusable bags when shopping. Volunteers after the clean-up exercise at Pandan Beach in Lundu. In previous beach clean-ups, she said the rubbish collected included not only local waste, but also those from Thailand, Vietnam, the Philippines, Taiwan, Mexico, and even Poland. This proves her point that rubbish can travel far and wide – from where it’s initially dumped and to where it eventually washes up. Alcila’s team of volunteers sacrifice their free time to help make the beaches clean again. She herself has been doing it since 2013 but noted the things have not improved much as littering on beaches is still quite rampant despite the many cleanliness campaigns. 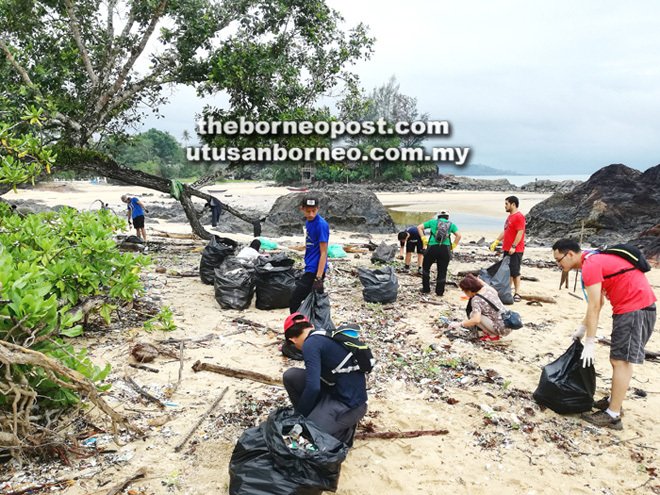 To promote her movement, she has been working hard to get the word out for clean beaches in Sarawak through @kuchingbeachcleaners on Facebook and Instagram.